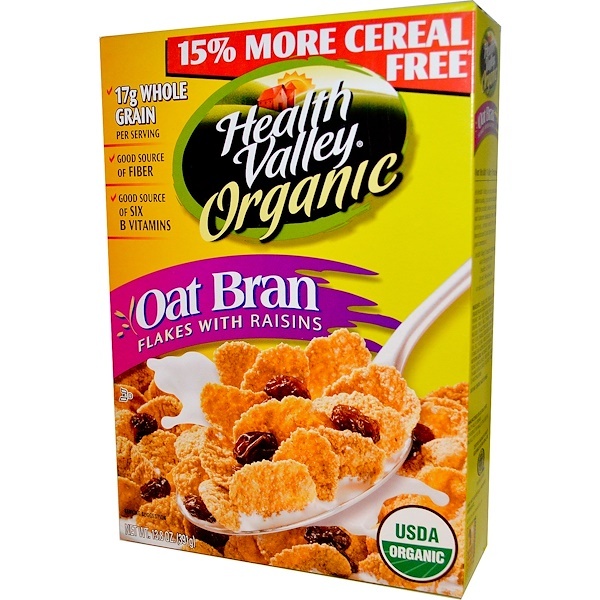 The healthiest breakfasts start with a great-tasting organic cereal with whole grains. Health Valley Organic Oat Bran Flakes with Raisins is a good source of fiber (4 grams) and has the benefits of soluble fiber as well. Soluble fiber from oats and oat bran, as part of a diet low in saturated fat and cholesterol, may reduce the risk of heart disease. 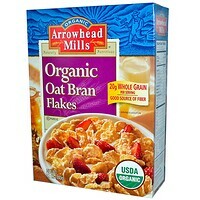 One serving of Organic Oat Bran Flakes with Raisins supplies 1.2 grams of soluble fiber from oats and oat bran. These great-tasting flakes come from oats grown on organic farms, so you can be sure that only the best, all-natural ingredients are used. By preferring foods that are grown without pesticides or other chemicals, you are not only protecting your health, you are also helping to protect our environment. Enjoy this great-tasting, nutritious cereal with milk or try Westsoy Soymilk or Imagine Rice Dream for a great new taste sensation. At Health Valley, we are constantly striving to meet your nutritional needs with the highest quality foods. You can be sure that all of our organic products carry the USDA organic seal. Health Valley Foods...assuring a healthy life for you and your family. 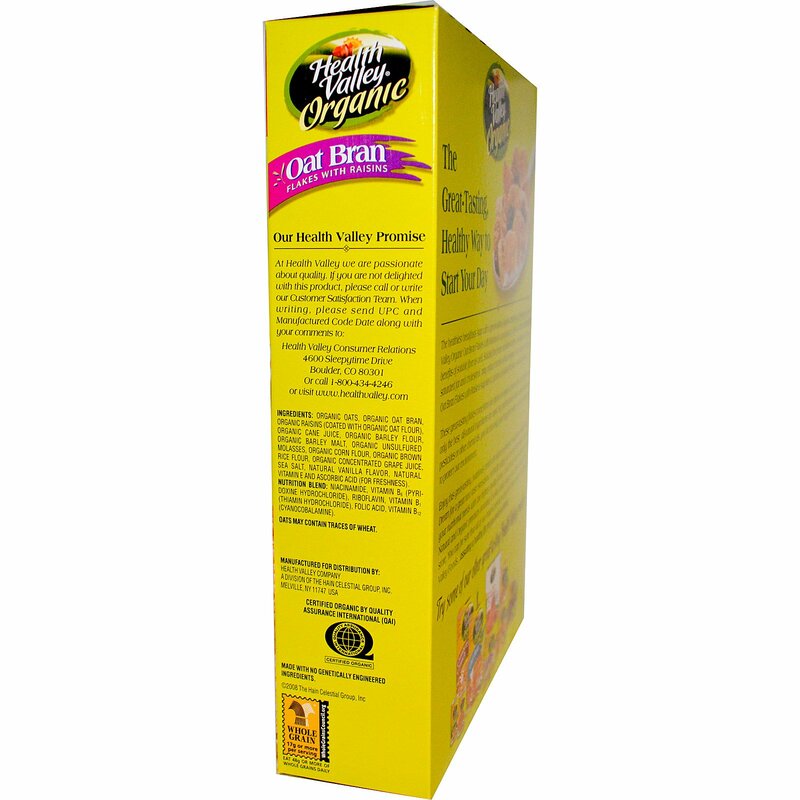 Organic oats, organic oat bran, organic raisins (coated with organic oat flour), organic cane juice, organic barley flour, organic barley malt, organic unsulfured molasses, organic corn flour, organic brown rice flour, organic concentrated grape juice, sea salt, natural vanilla flavor, natural vitamin E and ascorbic acid (for freshness). Nutrition Blend: Niacinamide, vitamin B6 (pyridoxine hydrochloride), riboflavin, vitamin B1 (thiamin hydrochloride), folic acid, vitamin B12 (cyanocobalamine). *Amount in cereal. One half cup skim milk contributes an additional 40 calories, 65 mg sodium, 200 mg potassium, 6 g total carbohydrate (6 g sugars), and 4 g protein.